Since their invention in 1954, the original stopbar and tune-o-matic have changed very little, if at all, which is a testament to their design quality and timeless functionality. Looking closely at this classic bridge/tailpiece combination that graces such legendary instruments as the Les Paul and the SG, it's easy to see why. Tune-o-matic: With the ability to easily adjust each individual string length using the six corresponding screws, precise intonation can be achieved. Two thumbwheels allow for bass and treble string height adjustment while two large bolts securely mount the bridge directly into the wood of the guitar effectively transferring string vibration and tone. 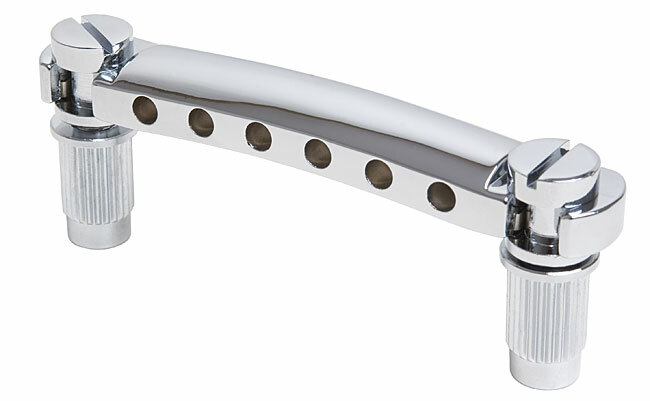 Stopbar: Positioned behind the tune-o-matic bridge, the stopbar uses two very large bolts and anchors that mount directly into the guitar. Because of its weight and stability, it is very effective at keeping the instrument in tune because it does not move. It is also very effective at transferring every string vibration to the guitar contributing to increased sustain and the overall tone of the instrument. 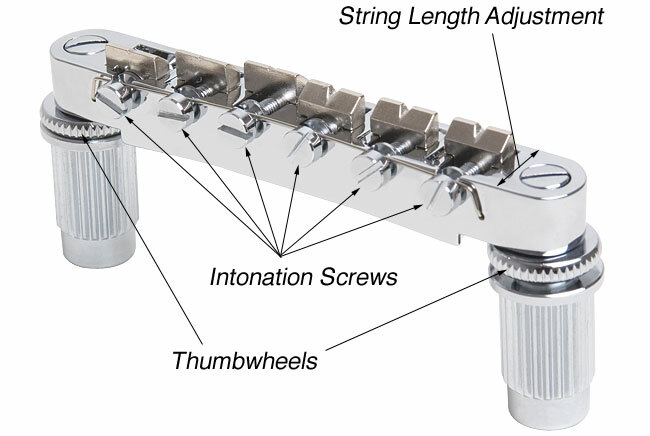 Additionally, the height of the stopbar can be adjusted to create more or less string "break angle" over the tune-o-matic bridge by rotating the two large bolts. In general, the greater the string angle over the bridge the better for tone and sustain but if you find that you are breaking a lot of strings at the bridge, you might try raising up the stopbar a little. 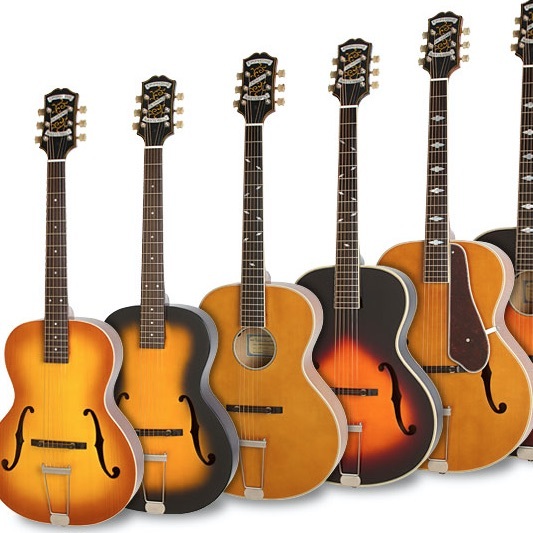 Despite the success and integrity of the stopbar/tune-o-matic system, Epiphone conducted tests and experiments to see if and how this classic combination might be improved upon. It was determined that two improvements could be made. During string changes when and if all the strings are removed, both the stopbar and tune-o-matic can and often fall off of their anchor bolts. This can result in a wide range of minor problems ranging from them disappearing under a road case to being put back on incorrectly to just general annoyance. Therefore, there needed to be some way to "lock" both the stopbar and the tune-o-matic on their posts - ideally, without the need for tools. After conducting sustain tests, it was determined that the tighter the fit of the stopbar and tune-o-matic on their posts and hence, the greater surface area contact - part to part - the longer the sustain and the better the tone. 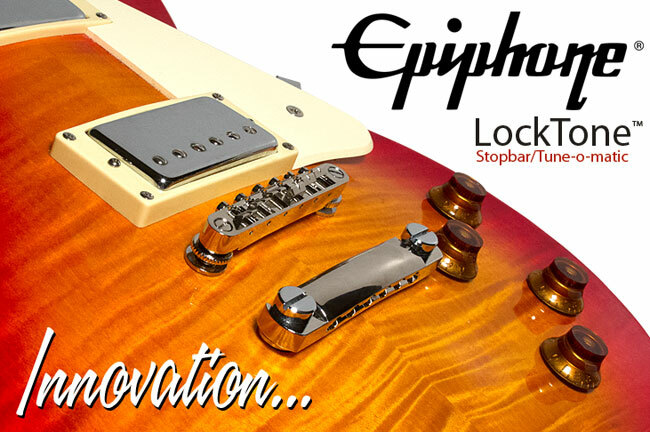 With these two goals in mind, we set out to further perfect the design and we are proud to announce the development and introduction of the "patent applied for" Epiphone LockTone™ stopbar/tune-o-matic system. Without adversely affecting their classic appearance and without the need for additional tools, this system not only "locks" onto the posts automatically and eliminates accidental drops, it also adds "tone" and sustain. In order to validate the above claim regarding sustain and tone, we conducted the following lab tests. Below are the results. For the first test we plucked the string under test and recorded the signal using Sonor™. After the signal was captured we analyzed the waveform using Sound Forge™. We made note of the RMS power (in dB) of the signal at impulse for 0.1 sec. and then made note of the RMS power for 0.1sec at 5 seconds from impulse. At this point we calculated the drop in decibels from impulse to 5 seconds for each string. We listed the average drop (over the 3 trials) for each string and then the overall average of the 3 strings combined. 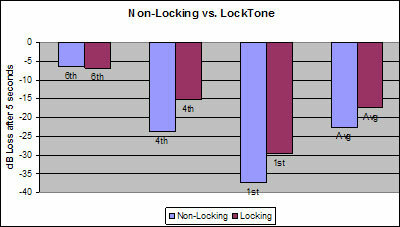 Based upon the above, the Epi LockTone™ system showed a nice increase over the Epi non-locking system. 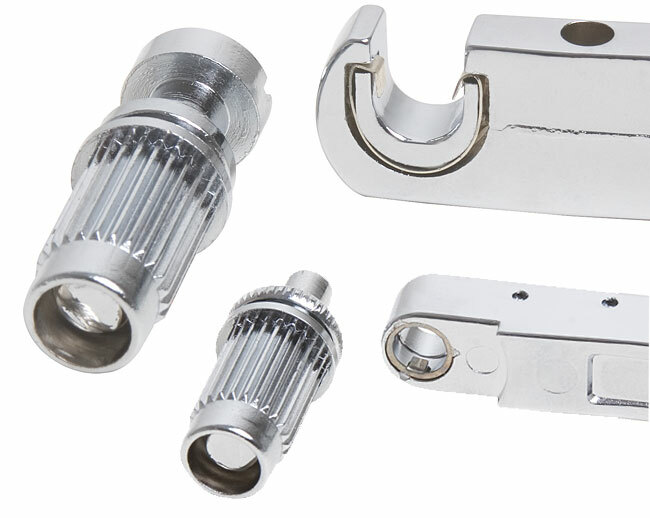 In general, the Epi Locking system was over 5dB better after 5 seconds. The other interesting conclusion is the fact that high strings do not sustain as well as low stings. After looking at the physics involved this result supports this theory. High frequency signals are dampened much quicker than low frequency signals. This fact also plays a large part in how well harmonic content is perceived in a signal. If you look at only the 1st string the increase from the Epi w/o lock to the Epi Locking system was over 7.5dB better. This increase should help with both the sustain on the high notes and the harmonic content of lower fundamentals. For the second test, we simply removed all the strings on a guitar equipped with the LockTone™ system. After removal, we turned the guitar upside down and shook it vigorously. Unlike the regular system, the LockTone™ did not move or come off the guitar. Based upon the above, we are satisfied that we have accomplished our two design improvement objectives. 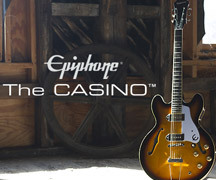 Thanks to the work of our staff and their passionate pursuit of performance, Epiphone is proud to announce the LockTone™ stopbar/tune-o-matic system. Unlike other systems that require tools to adjust and remove, the LockTone™ automatically locks the stopbar and the tune-o-matic onto their posts for added security and improved sustain.